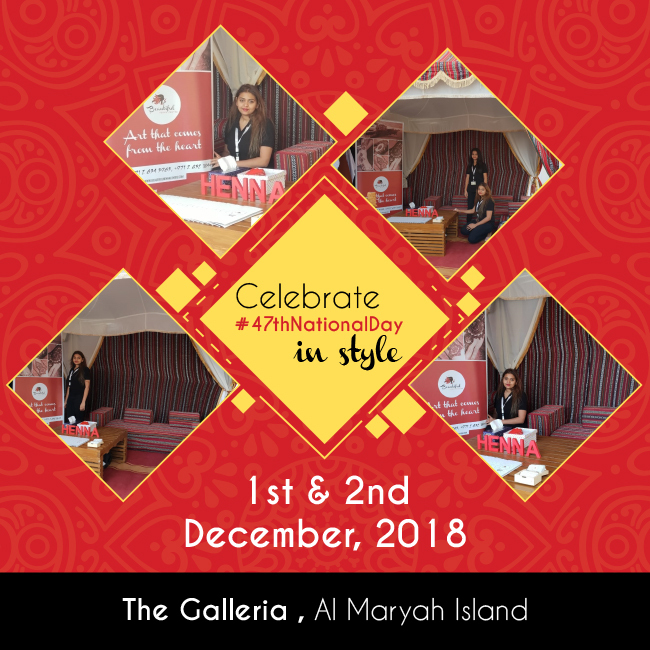 Welcome to the events section of our website; it is the most happening piece of this bundle of artistic excitement called – Beautiful Henna Centre. Here we keep updating about all the upcoming henna events and beauty events where you can come and see us. Not just see us, ofcourse you can get the henna and tattoos etc done there. In case you want to have a look at the kind of events we’ve participated in the recent past you can click on past events and go through the same. There are no upcoming events at the moment kindly check back later. Immersive Cinema at it’s best… back by popular demand after the hugely successful ‘Grease’ and ‘Mamma Mia!’ experience. Getting henna art done in this environment of movies, masti and high energies will be an experience to cherish, so do not miss the experience while you’re there. Just spot us on stall number 25 and say hi. 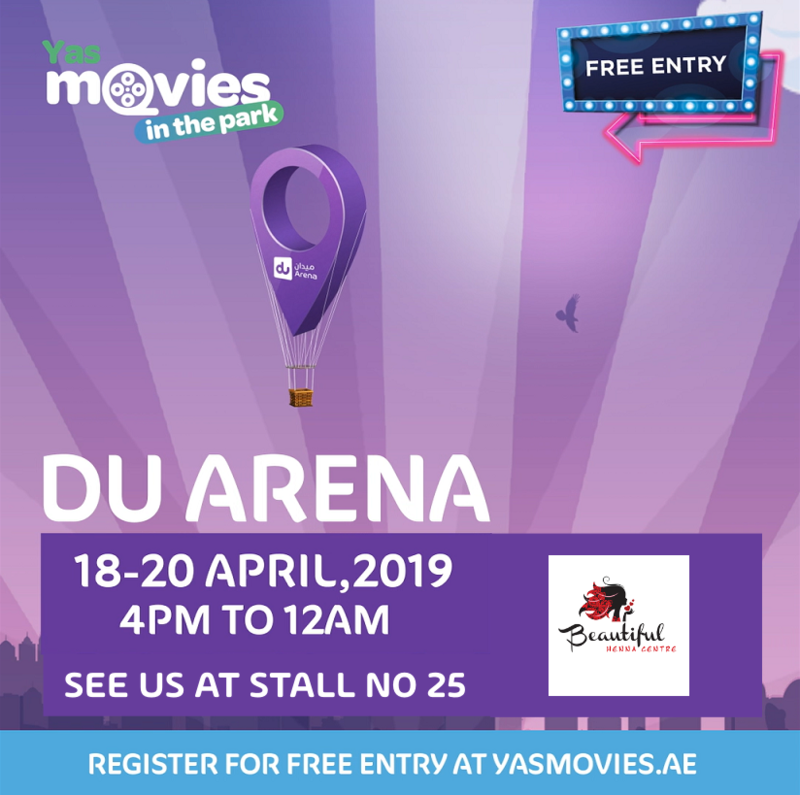 So get ready for this fun packed open air movies experience and yes don’t forget to see us! Date: 18th to 20th April, 2019. Experience and enjoy the colors of henna while you celebrate the magic of winter at Yas Winter Carnival 2018. Bask in the glow of happy holidays at the Yas Winter Carnival in Abu Dhabi with family and friends. It’s the most magical time of the year again with full of entertainment, music, food, fun, rides, events, shopping, fireworks, fashion, beauty and what not. And when it comes to beauty how can henna be missed and when henna is in talks how can beautiful henna centre be not. Getting henna art done in this mesmerising ambience will be an experience to cherish, so do not miss the experience while you’re there. Just spot us on stall number M20 and say hi. This is a five day event starting at 4:00 pm daily. 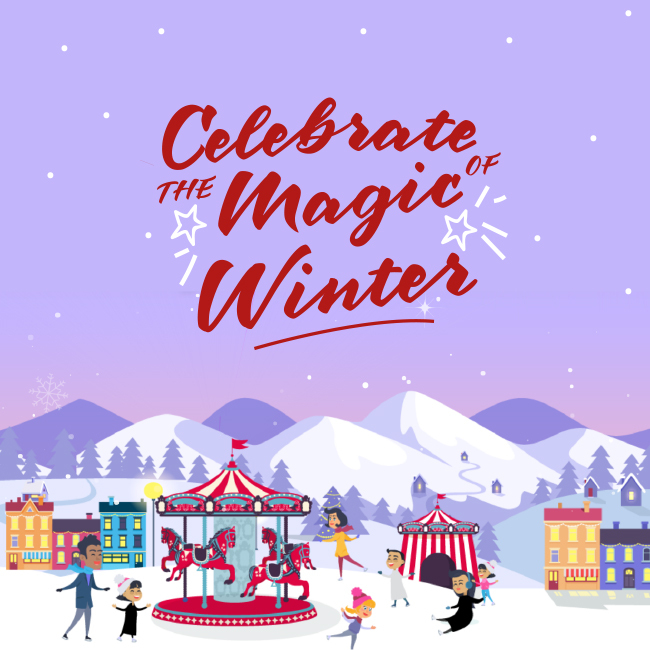 It promises to be the biggest celebration of winter in the UAE. Jam packed with non-stop live entertainment and music from an incredible line up of music acts, performing arts, prize giveaways and games galore! Take a wander through the festive winter market and discover the perfect gifts for the season. There’s everything from fashion accessories, art prints, henna, jewellery, home decor, cupcakes, toys, ice cream, kids clothing, coffees, teas, crepes, sweets, chocolate, pancakes, spa’s, mosaics, candles, Xmas themed gifts and much more. So get ready for this fun packed carnival and yes don’t forget to see us! Date : 11th to 15th November, 2018. Time : Doors open at 4 PM everyday. @Gateway Park South, Yas Island. Celebrate the 47th National Day in style!!! Experience an oasis of Emirati culture and the spirit of the union. The UAE National Day is fast approaching and we have something special planned for all the henna lovers! Enjoy various activities like live performances, traditional activities, selection of food trucks and last but not the least, decor your hands with intricate henna by #BeautifulHennaCentre. A perfect day to celebrate love, selflessness and tell your partner how much you care for them. The celebration of Karwa Chauth lasts only for a day but the preparations usually start a few days before. That is why Indian Ladies Association has brought you a Pre Karwa Chauth Bash to get you ready for the special occasion. 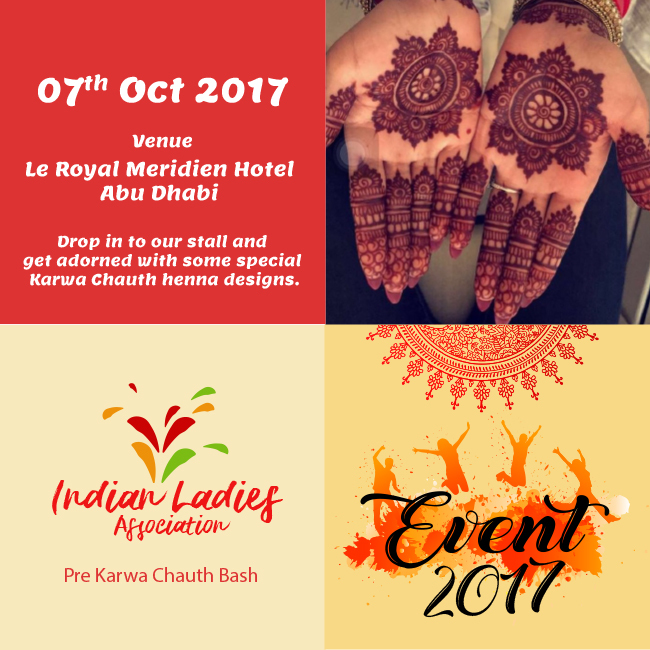 Join us for the Karwa Chauth Celebration at Le Royal Meridien Hotel Abu Dhabi. Beautiful Henna Centre is going to be there too. 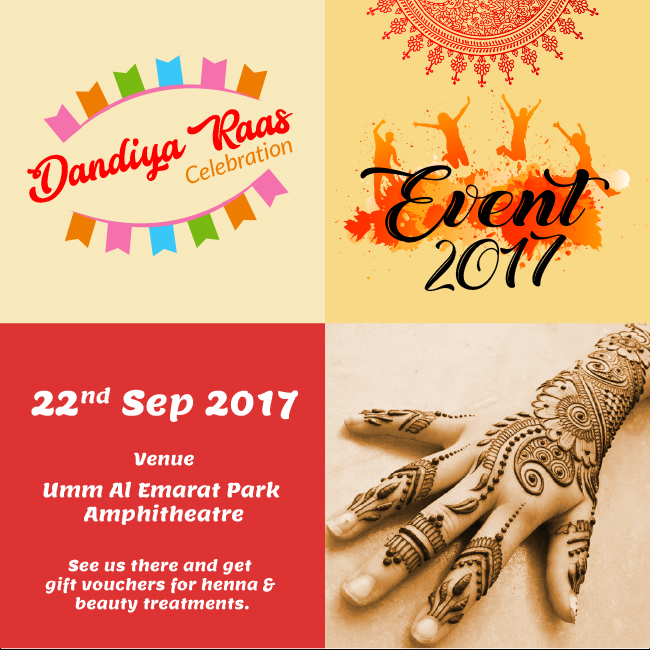 Visit us at our stall for some Awe–striking Karwa Chauth Special Mehendi Designs. A perfect day to take a break from your regular works and spend some quality time with your family. 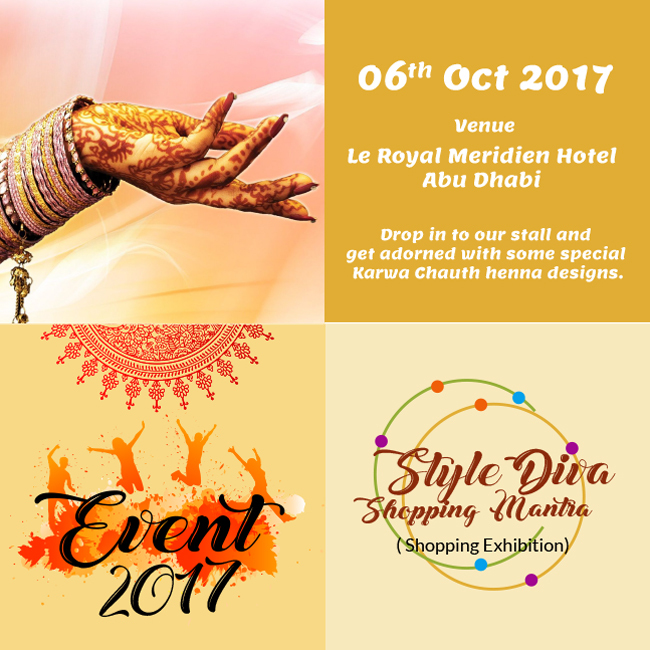 Come and be a part of this year’s Style Diva Shopping Mantra ( Shopping Exhibition) at Le Royal Meridien Hotel Abu Dhabi. Beautiful Henna Centre is going to be there with some beautiful henna designs. Visit us for some Karwa Chauth Special Mehendi Designs. A perfect day to go shopping with your family. 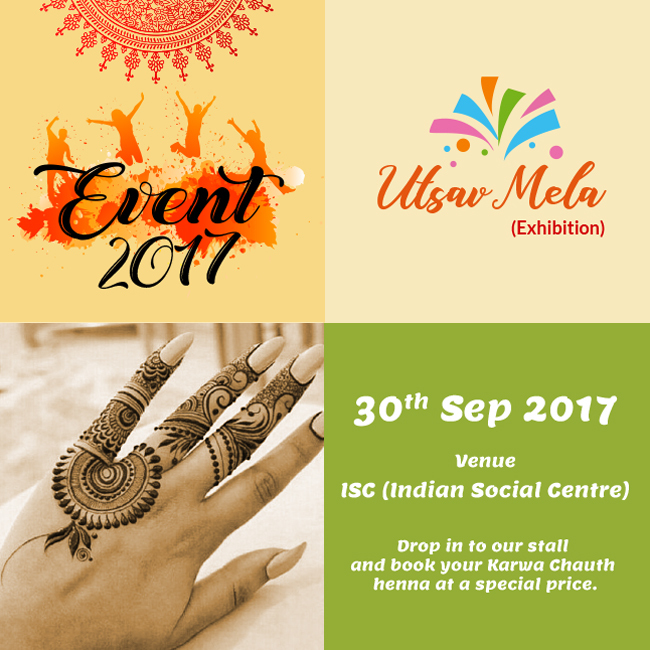 Come join us for this year’s Utsav Mela at India Social & Cultural Centre (ISC), Meena Street, Abu Dhabi, United Arab Emirates. Beautiful Henna Centre is going to be there with some exquisite henna designs. Come down to get some awesome henna done and we will also be giving you a chance to book henna services at special rates for the coming Karwa Chauth. Do visit us at our stall. A perfect day out with your Family. Come join us for this year’s Dandiya Raas. Enjoy DJ, Music, do some Garba Dance on the Dandiya Beats, Relish some Mouthwatering Food, Get some Mesmerizing Henna done and lots more fun awaiting. Oh! BTW, We are giving away some exciting gift vouchers for henna & beauty treatments at Beautiful Henna Centre. There you go… we have given you another reason to visit. More importantly, it is going to be an epic experience not to be missed. So, mark your calender today! Time sure flies by; We have turned 14th now. We are all very proud of the accomplishments and are grateful to our clients and team members who have trusted us and contributed to our success. 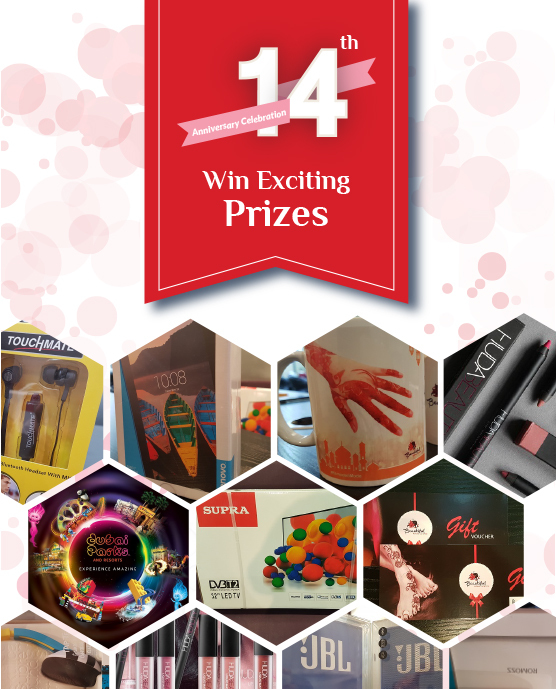 On the occasion of our 14th anniversary celebration we’re arranging a lucky draw for our darling clients on 22nd, 23rd & 24th of June, 2017. 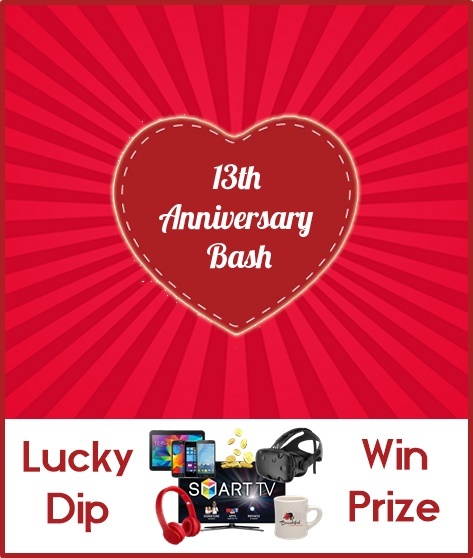 We will be organizing a LUCKY DIP – through which Winners will be a selected . You will be given one chance to pick a chit and that could win you so many exciting prizes. 1 & 2, Office Floor, Al Nasser Restaurant Building, Airport Road, Opp KFC, Abu Dhabi, United Arab Emirates. This promotion is only valid at Beautiful Henna Centre. The Lucky Draw is valid from 22nd June to 24th June, 2017. Client/Guest will be given 1 lucky draw chance. Featuring floor-to-ceiling glass windows, grand ballrooms, outdoor space, local and international cuisine and refined service, Rosewood Abu Dhabi is ideal for dream weddings, and so does our wedding henna art. Whether it is an Emirati or European wedding, or a blend of traditions, our bridal/wedding henna artists will assist you to achieve the perfect adornment for your D day. 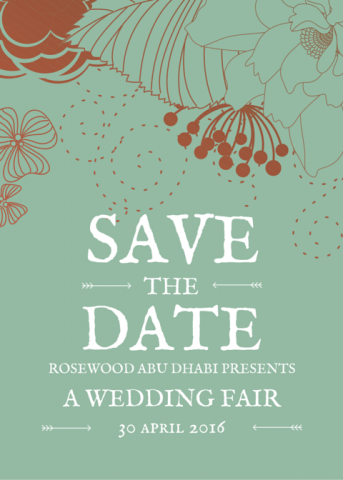 Rosewood Abu Dhabi prepares a wedding fit for Royalty and you are the main guest. Along with an array of trusted partners and seasoned professionals, we’re waiting to answer your questions and fulfill your dreams. Awaiting to see you there! Aloha is region’s hottest beach lifestyle event! 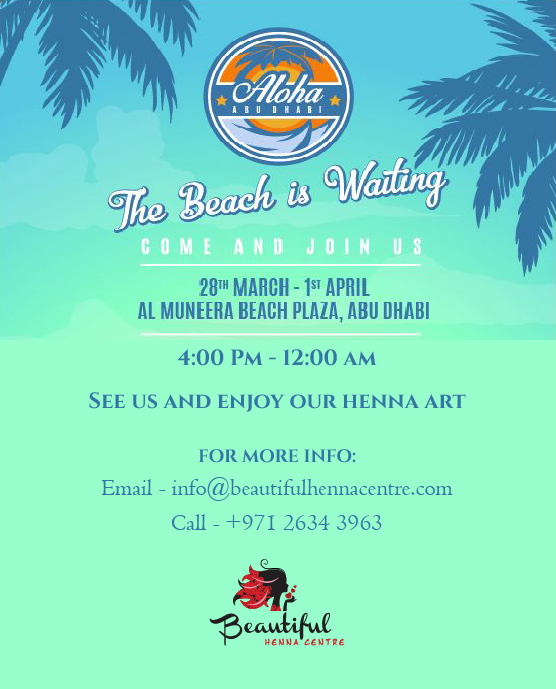 ‘Aloha Abu Dhabi’ at Al Raha Beach is ready to set temperatures soaring this March. The event first launched in 2016 and attracted more than 10,000 visitors from across the UAE. This year’s event promises to be even bigger and better. For five days Aloha Abu Dhabi will be home to the region’s most talented musicians, artists, street performers. And beautiful henna centre is delighted to be a part of that. 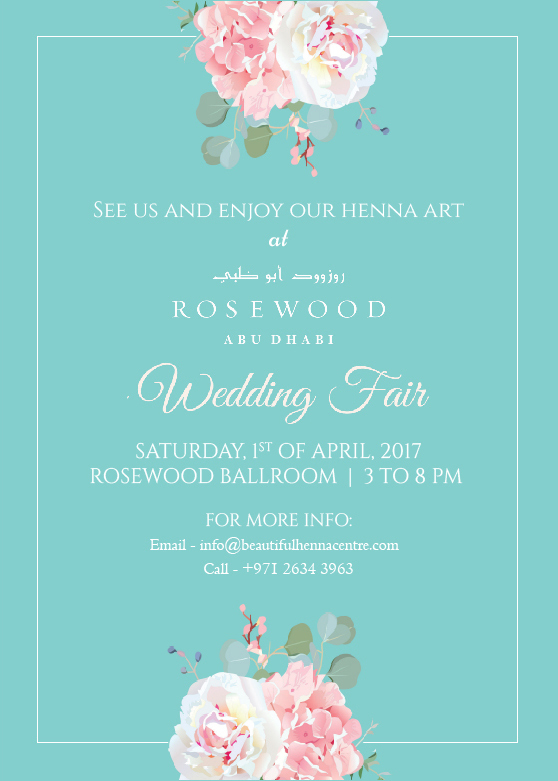 To make your experience even more exciting we will be hosting to the fanciest Henna Arts and latest Henna trends. So, come along with your friends and family for an awesome hangout on the shores of Al Muneera Beach Plaza. Enjoy the spectacular views over the blue waters of the Arabian Gulf. Awaiting to see you there! We are all very proud of the accomplishments and are grateful to our clients and team members who have trusted us and contributed to our success. 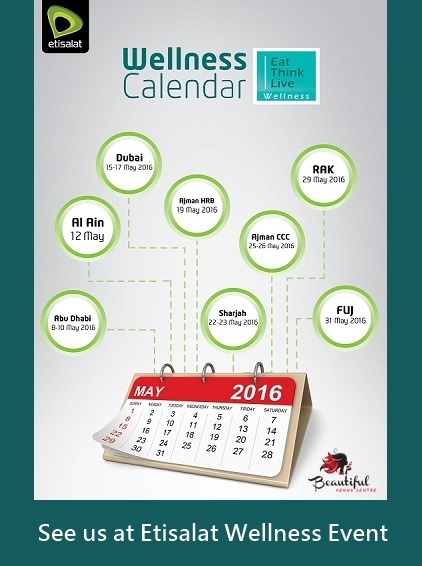 The Lucky Draw is valid from 2nd July 2016 to 4th July 2016. Healthy employees make healthy businesses, a philosophy that Etisalat endorses and practices through its Employee Wellness Program, conducted across its UAE offices. Etisalat Wellness Program is part of Etisalat’s employee engagement strategy, aimed to foster positive mental health, improve physical well-being and lifestyles, develop stress management and money management skills and help employees maintain a healthy work-life balance. We are proud to be one of their partners in this Wellness Program. Event will start on 9 AM till 3 PM at all the venues. From lavish banquets and receptions to intimate dinners and executive meetings, Rosewood Abu Dhabi offers the emirate’s finest facilities, location and services. 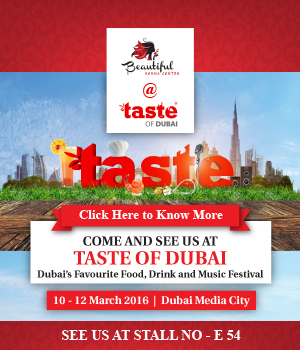 Taste of Dubai is now in its 9th year and is the City’s favorite food, drink and music festival. The festival is a 3 day food-lover’s fantasy, with exclusive fine-dining restaurants, world class celebrity chefs, and incredible line-up of international music. For all those food lovers you can come and watch live cooking demonstrations or get hands on and cook along with our tops chefs as well as learn some culinary top tips. Alternatively you can sit back, relax and soak up the sounds listening to our live entertainment or enjoy shopping for unique gifts and culinary products in our outdoor shopping area. 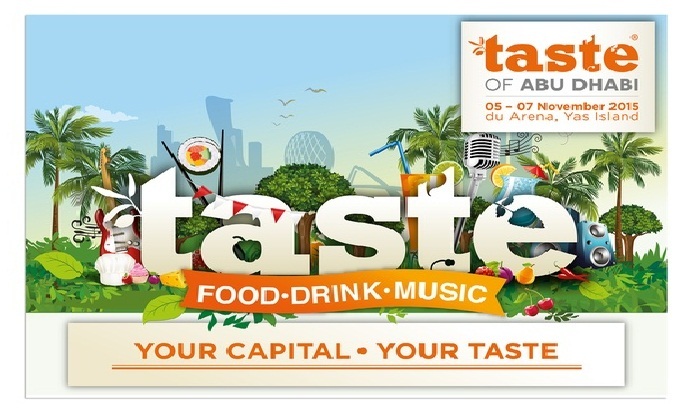 The Capital’s most-loved and talked about food, drink and music festival, Taste of Abu Dhabi is back again from the 5th-7th of November. An absolute foodie haven, this year it is bringing together 25 exclusive fine-dining restaurants, world-class celebrity chefs, and an incredible line-up of international music. Exciting day out for the entire family. 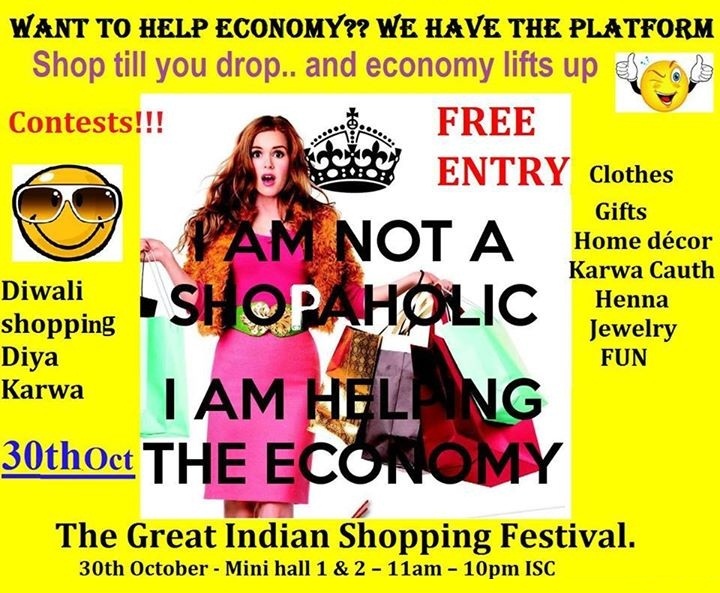 With stalls of Cloths traditional & western, accessories, home decorative items, Heena, activities for kids and vast variety of culinary delights. With items starting from AED. 5 – AED. 500/- there is something for everyone. With over 15 food stalls it’s a fest for all Foodies missing Indian chaat and street food. Please check back later or you can browse through our past events by switching the tabs.